Published in September 2002 in hardcover by River City Publishing. Published in two paperback volumes by Pocket Books in September and October 2003! A new trade paperback edition will be published in July 2007 by Pocket Books! It will include a teaser chapter for The Queen of Bedlam. New!!! Pocket Books recently released a two-volume paperback edition of Speaks the Nightbird. The first volume, Speaks the Nightbird, Volume I: Judgment of the Witch, went on sale in September 2003, while Speaks the Nightbird, Volume II: Evil Unveiled followed in October 2003. Speaks the Nightbird in hardcover is currently shipping from River City Publishing to dealers around the country. Any bookstore should be able to order it, whether they plan to stock it or not. The list price for the trade hardcover edition is $27.95. The book is available in a hardcover trade edition and a signed, limited edition. The list price for the signed limited is $125. River City Publishing printed 500 copies of the limited. It can be ordered by calling River City Publishing, or from Shocklines and other specialty booksellers. The book is 726 pages in length. New!!! The first edition can be identified by the lack of a "First Edition" statement on the copyright page. If there is a second printing of the trade hardcover, it will be identified as a "Second printing" on the copyright page. There are 15,000 copies of the first printing of the trade hardcover edition of Speaks the Nightbird. The cover artwork is by Michael Dolinger. Update!!! The Japanese edition of Speaks the Nightbird was published by Bungeishunju in August 2003! Thanks to Naomi Hoida for that information. 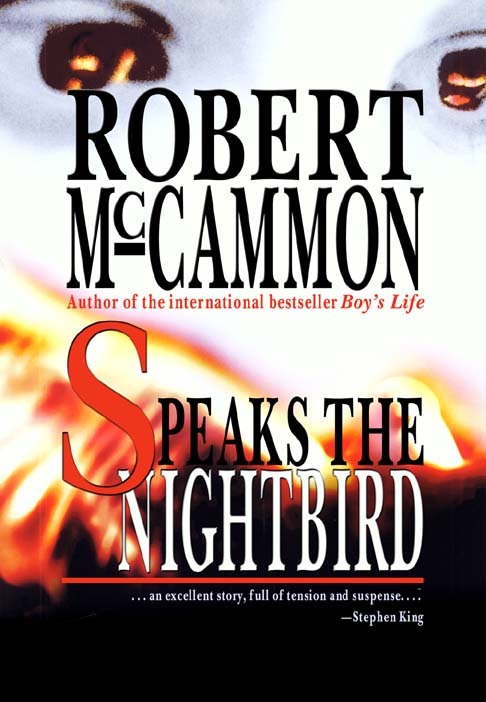 Robert McCammon, author of the best-sellers Boy's Life and Gone South, returns to the forefront of American fiction with Speaks the Nightbird. Is there a witch in Carolina in 1699? The people of the town of Fount Royal think so. Her name is Rachel; she's foreign, beautiful, and brave--no wonder so many people hate her. Comes a traveling magistrate to hold a witch trial, and his clerk, Matthew. The evidence spells doom for Rachel: witch's tools are found in her home, she will not speak the Lord's Prayer, and witnesses swear they've seen her commit unspeakable acts with the Devil himself. But Matthew hears the call of the nightbird. He wonders--is there any such thing as witchcraft? If Rachel can fly through the night on wings of evil, why hasn't she escaped from the town gaol? And the town itself--who murdered Rachel's husband? How did the ratcatcher learn to hypnotize his prey? Who stands to gain if the witch is burned? God and Satan are indeed at war in Fount Royal, and even the innocent are not safe. In the end, Matthew follows his head and his heart, and Rachel keeps an unlikely appointment with destiny. --From the back of the River City Publishing Advance Reader's Copy of Speaks the Nightbird. Click here to read the review by Gary Carden. Click here to read the review by Craig Clarke. Click here to read the review of Book 1 by Martina Bexte. Click here to read the review of Book 2 by Martina Bexte. Click here to read the review by Bill Braun. Click here to read Chris Fletcher's 5-star review. Click here to read Ryan MacMichael's comments. 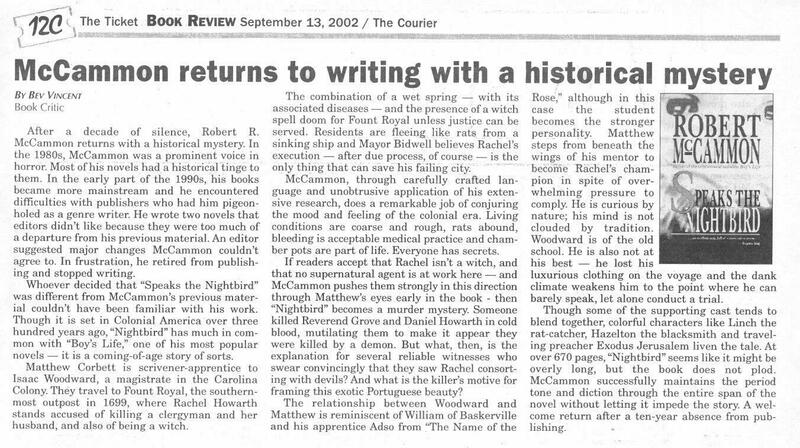 In an article entitled "Best reads of 2002," three Montgomery Advertiser readers selected Speaks the Nightbird. Click here to read the comments. Click here to read a review by Jim Brock. 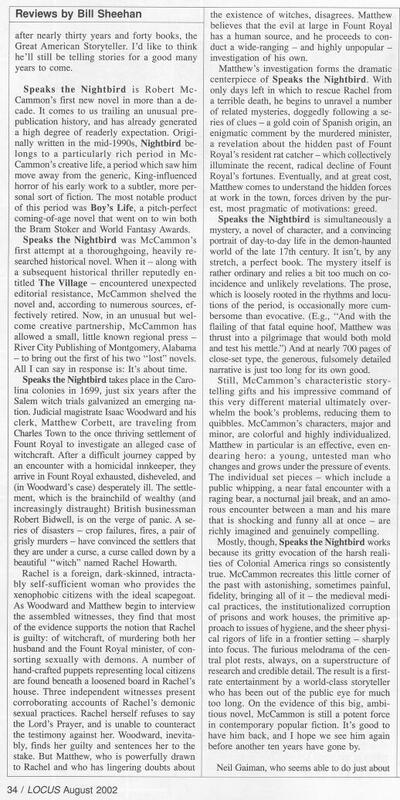 Speaks the Nightbird was selected one of the 76 best books in America out of 2,000 nominations by the independent booksellers of BookSense.com. Click here to read a review by Wayne C. Rogers. Click here to read the review by Gary A. Braunbeck. Click here to read the "Grade: A" review by Mark Graham. Click here to read the review by JC Patterson. Click here to read the review by Bev Vincent. Thanks to Bev Vincent for providing the scan. Bev now has a site, Onyx Reviews, collecting all of his book reviews, including his review of Speaks the Nightbird. Click here to read the review by Ali Karim. Thanks to Ali and Shots eZine for providing the review. McCammon, Robert. Speaks the Nightbird (River City $30 Signed). As a great fan of Boy's Life ($7.99), like Tom, I am thrilled to get this after such a long hiatus. McCammon deliberately chose a small press. The dark and atmospheric story is set along Carolina's Colonial seacoast where a pair of investigators is sent to a settlement to inquire into a young woman's arrest for witchcraft. If you think this is Salem revisited, guess again, it's a crime novel with the usual root of all evil, but doesn't spare us the grim realities of frontier life. Highly recommended. Publishers Weekly adds: "A trial for witchcraft proves the tip of an iceberg of intrigues in McCammon's absorbing historical mystery, the first newly published novel in 10 years from the bestselling author who rivaled Stephen King in the 1980s with such supernatural novels as Usher's Passing and Baal. A compulsively readable yarn. McCammon's loyal fans will find his resurfacing reason to rejoice. Those who enjoyed the author's last three novels (MINE; Boy's Life; Gone South), studies of the human condition that transcended genre labeling, will snap this one up, too." "Given Rick McCammon's ten-year silence, I was curious about NIGHTBIRD...eager for a new dose of one of America's truly fine story-tellers...delighted it was a BIG dose...and nervous, too. 'Cause writing novels is NOT like riding a bike--you can forget how to do it. Twenty pages in, I forgot everything but the book itself. "Speaks the Nightbird is a rarity in popular fiction, a book that manages to be thoughtful as well as entertaining—think 'Burn, Witch, Burn' crossed with Arthur Miller's The Crucible. "...The week I spent listening to the nightbird every evening between eight and eleven was a very fine one." 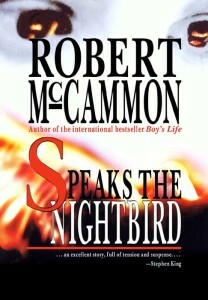 "No one can paint word pictures as vividly as Robert McCammon and never has his palette had such depth as in Speaks the Nightbird...the story is as timely as today. It's about superstition, prejudice, good and evil, hatred and love. Told with matchless insight into the human soul, this novel makes for a deeply satisfying read. River City Pub. Sept. 2002. c.676p. After a ten-year absence from publishing, McCammon (Boy's Life) returns with this historical novel of colonial Carolina. In 1699, legal clerk Matthew Corbett accompanies magistrate Isaac Woodward to Fount Royal, where he has been summoned to decide whether a witch is living in the newly established settlement. The two are immediately thrown into danger, even before they reach the town. And once there, they must deal with the inhabitants, some of whom stand to gain if Rachel, the accused, is executed. Soon it becomes obvious to Matthew that everyone has secrets, even the magistrate. In the end, he alone must try to unravel the mysteries. While many of McCammon's prior novels dealt with the supernatural, his latest contains horrors that are more real. McCammon also provides extensive historical detail, re-creating the legal procedures, medical practices, and everyday existence of the time. The language and situations are often disturbing, especially because many of the accusations against Rachel are sexual in nature, but McCammon tells a compelling story that should find a wide readership. Highly recommended for popular fiction collections. —Joel W. Tscherne, Cleveland P.L.. I finished Speaks the Nightbird this morning, and just wanted to say how much I enjoyed it. It's a splendid piece of work, with a marvelous plot, a setting that comes to total life, and thoroughly believable characters. It's so good to see Rick McCammon back with a new novel, especially one as involving and entertaining as this. The 676 pages seemed to fly by. Though not a horror novel, McCammon's taste for and talents at creating the horrific is well-served here, and horror fans won't be disappointed. In fact, I can't imagine anyone being disappointed in this wonderful story. Click here to read the review by Bill Sheehan. Thanks to Bev Vincent for providing the scan. In Colonial South Carolina, the settlement of Fount Royal awaits the arrival of a magistrate from Charles Town who will decide the fate of accused witch Rachel Howarth. The year is 1699, poised on the brink of a new century. Settlements on the edge of the wilderness teeter between civilization and savagery. Into this cauldron marches Magistrate Woodward, a true judge, a fair and honest man. With his clerk, Matthew, Woodward traverses the territory between Charles Town and Fount Royal, through "a joyful day for frogs and mudhens," but for the two travelers, "chill rain coiled chains around the soul." So this tale of mystery and moral courage begins, crafted by McCammon, author of Gone South. The trembling boundary of the eighteenth century comes alive, seen through the discerning eye of Matthew. Fount Royal customs, clothing, and beliefs are shown in every scene. For example, one townswoman intends to sell locks of the accused witch's hair as good fortune charms, and seeks to capitalize on the burning of the witch by selling cakes and pies at the event. In this woman's house, a nest of wasps hangs above her dining table to rid her home of the ever-present mosquitoes. The mayor's home offers colonial meals, from "coarse-grained jonakin bread that tasted of burnt corn" to "toss 'em boys," greasy roast chicken. Still, in every corner of the town lies the shadow of Rachel Howarth. People are so afraid of the hooked claw of Satan that many have abandoned Fount Royal. However, is Rachel truly a witch, or is she a pawn in an elaborate and desperate game? Matthew sees pieces of the puzzle that don't fit, and asks questions that find no answers. Woodward frets about his clerk. He sees Matthew's search for truth as the pursuit of a "nightbird," sure that Matthew's desire to prove Rachel is not a witch will lead Matthew to ruin. Try as he might, Woodward can't dissuade his young clerk from the reckless pursuit of Matthew's nightbird.